Come and experience Grangeville and its opera, entertainment and theatre scene. This welcoming city attracts visitors thanks to its cafes and shopping. With a holiday rental, you get a home away from home – many rentals offer full kitchens and outdoor grills for some home cooking. The nearest airport is in Lewiston, ID (LWS-Nez Perce County Regional), located 54.9 mi (88.3 km) from the city centre. Where to stay near Grangeville? Our 2019 accommodation listings offer a large selection of 6 holiday rentals near Grangeville. From 2 Houses to 2 Estates, find unique holiday homes for you to enjoy a memorable stay with your family and friends. 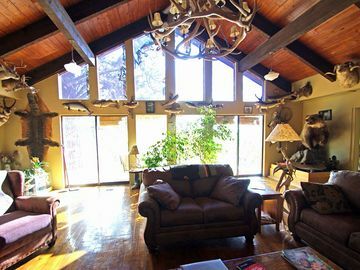 The best place to stay near Grangeville for a long holiday or a weekend break is on HomeAway. Can I rent Houses in Grangeville? Can I find a holiday accommodation with internet/wifi in Grangeville? Yes, you can select your preferred holiday accommodation with internet/wifi among our 5 holiday homes with internet/wifi available in Grangeville. Please use our search bar to access the selection of holiday rentals available.